Our Elsa’s Frozen Party Princess has her own page here. We have wonderful princess party for girls will turn your daughters party into a wonderful magical event. We have the right mix of magic, royalty, entertainment, fun, music, dancing, games, face painting and/or balloon models. All of this will delight and amaze your daughter and all her princess friends. 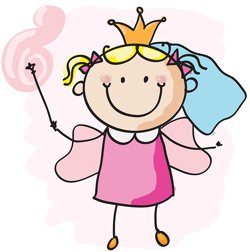 Our entertainers arrive at your party in their beautiful princess dress, crown and wand. Even more importantly, we will occupy all these children that will be in your house for your child’s party. You can throw away your worries and total panic. There will be no need for you to keep them occupied and distracted. We will distract, occupy and entertain them so you can enjoy your glass of wine or lemonade! We structure our shows to suit your party audience. After all, a 7 year princess will not enjoy that what a 3 year old would 🙂 Having said that, our princess party for girls can also be structured to suit an audience with a mix of 3 to 7 or 8 year olds. Just a little word of caution, should there be any princes in attendance (and especially in the minority and at the ripe old age of 7 or 8) maybe they shouldn’t! The following running order is a sample of one of our parties. The party content and structure are totally flexible and can be altered to suit your requirements. The start and finish times are also flexible and ar based on our 90 minute package. 4:15 pm (ish) : You can dish out the party meal and our princess entertainer will make balloon models or apply stencil tattoos or face paint with party music playing to a mini disco in the background. We bring our own music. 4:45 pm : (or later) Our princess will start heading off! We always stay until all children have received their balloons and/or are painted. We can also help you put your party planning. Here is our party plan that has evolved from over 25 years experience covering 1000′s of parties nationwide. And we also supply (as an optional extra) a wonderful selection of personalised of boys and girls party bags and party favors. Your Christening or Holy Communion guests will be delighted in receiving delicate little favor gifts, a thank you and a memory keepsake of that special day spent together. We have all our Princess package costs online, so have a look around. We hope that we have something that suits you. If not, please contact us with any questions or requests that you may have. We have always published our prices online since we worked out how to upload way back in 1996. And now we have the most comprehensive list of party packages that offer the best value, variety and children’s entertainment in the country. We also supply entertainers to all types of corporate or community events and festivals. See our Facebook page for more pictures and testimonials.